As a parent there are a lot of things you can do that will help your child develop strong and healthy teeth. While regular visits to a pediatric dentist should be part of the plan there are things you need to reinforce on your own to ensure your child doesn't develop tooth decay. A dentist is great for instructing children how to brush and floss properly but we all know kids listen most to their parents and if you want to have your children practice proper oral hygiene, teach them how to take care of their teeth. Everyone knows about brushing, but flossing is just as important. Flossing helps to remove dental plaque that gets trapped between teeth and along the gum line where a toothbrush can't often reach. It is suggested that you teach your child how to floss when they are 2 or 3 years old. You may need to assist your child for awhile before they are able to floss successfully on their own. Start by explaining to your child why it is important to floss. Simply asking a child to do something with no reason is never a good idea. When your child understands that flossing is important to keeping their smile healthy they will be more likely to adopt the practice. Start with a piece of floss that is roughly 18" in length. Show your child how to wrap the ends of the floss around the middle or index fingers on both hands. For the first few times you will probably have to guide your child so be prepared to lean down and offer assistance. Gently guide the floss between your child's teeth, carefully moving the floss around the tooth and under the gum line. 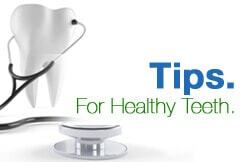 Be careful not to rub too hard since flossing can easily cause bleeding if done roughly. Always check that the floss is going between the gum line and on the side of each tooth. When finished show your child how to properly dispose of the floss and to rinse their mouth out. Check the floss to see if it is frayed or split since this often indicates they flossed too hard. Flossing should be done at least once a day and usually takes less than two minutes. However, you can tell your children that flossing is acceptable anytime they feel they have food stuck in their teeth.